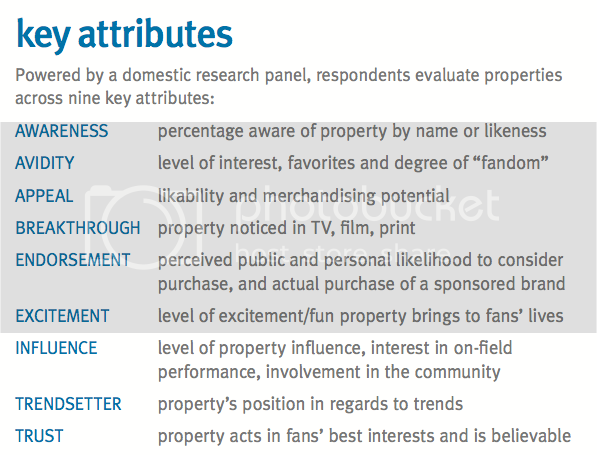 A survey of 300 sponsorship decision makers, by Dallas-based Omicom agency, The Marketing Arm, is the foundation for a new product called the Sports Property Index which aims to help brands more objectively evaluate sports properties across nine different attributes that were deemed most important. The data used to evaluate properties across these attributes was initially seeded into the database by evaluations of each property with US or Canadian consumers. Updates to the data will be made from similarly structured quarterly surveys with consumers. The nine categories measured are awareness, avidity, appeal, breakthrough, endorsement, excitement, influence, trendsetter and trust. "Historically, our industry has relied heavily on speculation and assumptions when making sponsorship decisions," said Marketing Arm president and CMO, Dan Belmont. "The SPI replaces hunches and guesstimates with valid and reliable data. Because it was created from the brand's perspective, it presents marketers with apple-to-apple property comparisons on factors that are most relevant to sponsors and serves as a baseline analysis for measuring the value of a sponsorship to a brand." The agency began by validating and weighting the issues that are most important with 300 decision makers who are responsible for on-going sponsorship. "These are the brand-centric sponsorship attributes chosen by brands and agencies as the key drivers determining a property's ability to influence brand affinity and consumer purchase intent," added Belmont. "The index allows us to assign an actual score to the properties in our North American portfolio," said Angie Tipton, manager for corporate sponsorships at HP, an SPI subscriber. "As we work to balance our sponsorship activities across key global markets, the SPI becomes highly beneficial." Here's a screenshot from the demo, where it would appear Ohio State beat Mississippi State in every single category. Even trust! Ouch.